I have been searching online through my friends and I am happy to report that several wonderful clowns have agreed to allow me the pleasure of interviewing them for this blog and I am happy to note several of them have given me permission to paint a colorful painting of their clown persona. Stay tunned for the actual interview’s! Who inspired them to become a clown? Where did they receive training? How long have they been a clown? Are they involved with any clown organizations? How do they feel their clown has evolved over the years? I have learned a little more about clowns and I know there are different types of clowns, What kind of clown are you and what do you feel is your clowns most interesting characteristic? Have you ever worked in a Circus and if so which ones? Do you have bits that are standard in the clown world or do you create your own acts? If so did you make them yourself? If you are in a parade do you ride anything? Bike, Unicycle, Clown car? Is there video we can watch of you on the web acting as a clown for us to enjoy? These are just some of the questions I have come up with. Can you think of any questions you would like to ask a seasoned preforming clown? I love clowns and I am really going to enjoy getting to know all of the great clowns I interview! As to the artist who paint clowns, besides myself, I have sent out a few notes to a few I know about, but have not heard back from them yet. I will contact a few more and see if we can get this blog going. If any of you know of an artist that paints clown portraits please drop me a line with there name and contact information. I would like to interview them and provide a link to their information and feature some of there great paintings. I am not wanting anything in return just the opportunity to see and share other artists work of great clowns. One note if they paint scary clowns – I am not interested. As an artist who paints clowns and shows my work to the public. I fight the public fear of clowns which have been influenced by the movie “It” and other scary images every time I have a show. This blog is for happy, fun, sweet clowns and sad hobo clowns only! Nothing scary allowed. This is a painting of Senor Billy the Hobo Clown. The original photo was taken by P.S. Zollo. (- who posted it on Flickr follow the link to see the original. 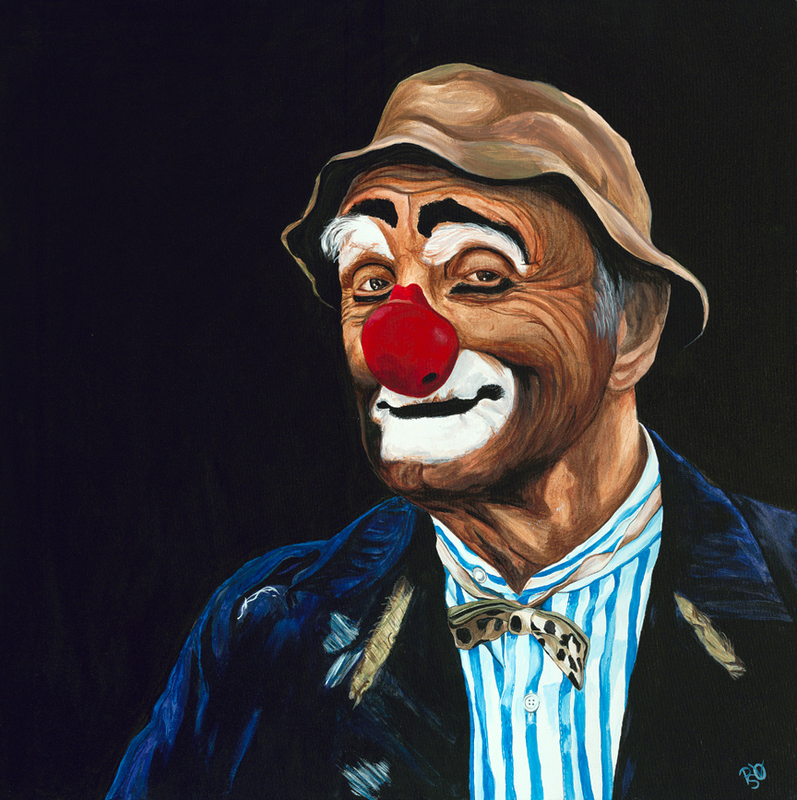 This is the second painting in my “The human side of a clown” series. Mr. Zollo had the honor of meeting Billy the clown in person. His real name is Billy Beck. This is what Billy told Mr. Zollo during their photo shoot “In the Forties he was a clown at the celebrated Cirque Medrano in Paris and shared the stage with Buster Keaton, among others. Born in 1920 in Philadelphia, he was an artist and cartoonist, and started sketching the sad clown epitomized by Emmett Kelly when he was just a kid. He went with the army to France during WWII and stayed there, becoming a clown first on the street before he graduated to the stage.” When he posed for the photo’s on this fine day it was the first time he had worn the tramp makeup and costume in about 46 years. It all fit him wonderfully. I only hope I have done him justice. Why a page about Clown Portraits?